Nothing can beat the pure terror you felt for Tim and Lex while you watched them hide in a kitchen while raptors creaked open the door and sniffed them out for their next meal. Hands gripping your chair, heart beating fast, eyes refusing to blink...I get it all, every time. Under the guidance of the game warden, Robert Muldoon, the movie opens with the park migrating a raptor between holding pens. Unfortunately, the holding pen and cage aren’t lined up correctly and a person ends up eaten—a disaster scenario if I’ve ever seen one. On seeing this scene for another time, it’s somewhat similar to what can figuratively happen when doing an infrastructure migration into the cloud, isn’t it? If things aren’t lined up perfectly, then it can result in lost data. Muldoon tries valiantly to save the situation, but ultimately could not. This disaster event at the film’s outset raises questions among investors, which prompts them to demand a security review of the park. This is no different from a real-life audit scenario, where clients or stakeholders want reassurances for how well your business can actually protect sensitive information. Unfortunately for Jurassic Park, they had to prove the stability of the island within 48 hours – all while a competitor of the park was secretly enlisting a disgruntled IT cybersecurity professional, Dennis Nedry, to sabotage the park and steal sample embryos (AKA intellectual property) for analysis. Throughout the beginning of the film, the park touts the latest technology, everything from virtual reality displays to machine learning, automatic cars and touchscreens—all things that were a big deal back in 1993 when the film came out. But without the park’s technology systems up and running, the glamor quickly falls apart. The downtime Nedry causes to steal the dinosaur embryos is only worsened when a bad tropical storm rolls in. All of these scenarios, however, don’t mean Muldoon isn’t a seasoned veteran at what he does. In fact, his gruff demeanor says that he sees a lot of these events coming but given the lack of buy-in from the rest of the business, can do nothing. In other words, Muldoon represents an IT security veteran who’s seen and survived through multiple breaches and disaster events, but again and again must almost single-handedly mitigate the fallout of a company that’s unwilling to do a total refresh of its infrastructure. He knows how cybercriminals (raptors in this case) think. Muldoon is not confident in the park’s ability to keep the dinosaurs at bay. Raptors, he says, are testing the electric fences for weaknesses constantly, which is much like cybercriminals do when test a business’s network for weaknesses. Not only does an outage create the widespread disaster at Jurassic Park; it leads to massive data loss – research that could have transformed the world. Ray Arnold, the IT person that everyone turned to after his co-worker had sabotaged the park’s IT infrastructure, seems to be critical from the beginning that the park could actually function in the first place. Perhaps he knew something management didn’t? An IT individual might feel some affinity for Arnold, since his repeated calls for concern go unnoticed among leadership. At one point, he even references putting an item on “the glitch list” – something that should never pile up. Sabotage from a disgruntled employee could have been curbed if the park had had a good risk management policy in place, along with precautions such as change logs, two-factor authentication and a DR backup plan to strengthen the IT systems. When the power outage forces Ray Arnold to manually reboot the computer systems of the entire park, even more animals escape, which pushes several people into further danger. Here, a DR playbook would have provided some structure on how to notify all affected parties of what to expect, as well as what to avoid during the reboot process. A cumbersome infrastructure at best, people must go outside to another building to physically turn on the generators. This location, in the heart of velociraptor territory, not only is poorly-planned but could be avoided with an infrastructure upgrade. When velociraptors escape and make it into the building where Arnold is trying to turn the power back on, the situation ultimately leads to his demise. The disaster at Jurassic Park should act as a cautionary tale for any executive leader or board member, where the owner, John Hammond, should have invested in a robust IT strategy and significant insurance coverage. He keeps saying throughout the movie, “Spared no expense,” but apparently, he’s been focused on the wrong areas. Plus, leaving IT systems entirely in the hands of an employee who is visibly disgruntled with his pay and treatment is, well…poetic justice? Hammond’s leadership during the crisis is integral to the smooth execution of the recovery process, but he is more concerned at times with the “product” (dinosaurs) than the lives of those involved. Indeed, the personnel behind a solution are of paramount importance, since every company is ultimately comprised of people, and the team you employ will often be the team recovering your IT systems after a disaster event. Talent retention is key to a successful business. Hammond’s favored attention for the dinosaurs rather than of his own employees does little to inspire their commitment during the crisis and, I’m sure, ongoing employee retention. The original Jurassic Park film is a story that cautions against not only genetically modifying dinosaurs, but also the practice of going without a strong and regularly-tested IT-DR plan. Any business can feel like a deranged theme park at times, especially when a disaster event occurs. 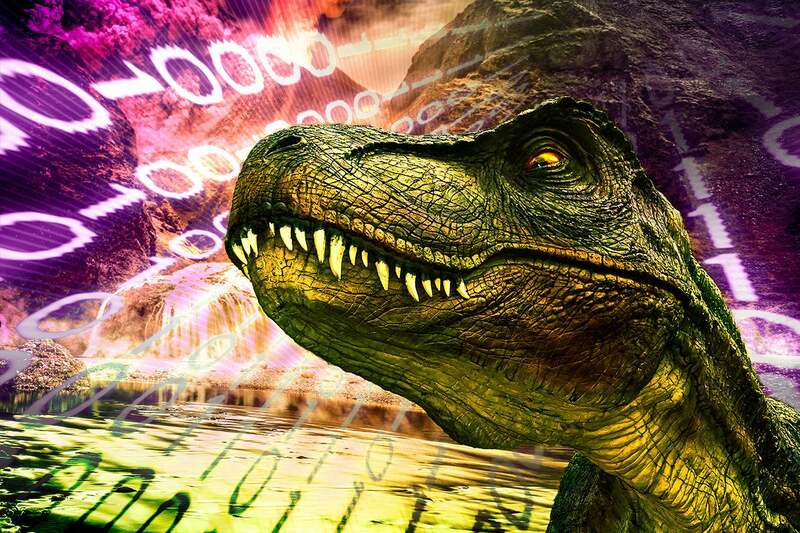 However, with a strong IT strategy in place to recover from likely and unlikely scenarios, you can better prepare for evolving threats – such as when dinosaurs escape across an island. If we picture the film not in 1993 and instead, based in modern day, really the park should have had at least a hybrid cloud-based model where they could access data from an off-island location. Furthermore, if they had a managed Disaster Recovery as a Service (DRaaS) solution, a team of experts would have recognized when the island went silent (no more replication coming into the cloud environment) and would have tried to reach out to see what happened. If they couldn’t contact the park’s IT team, the DR provider would have begun the declaration process on their own to restore order and send help to save people on the island. A good IT-DR strategy begins with a conversation between IT and business leaders about what are the most crucial assets to protect during a disaster – then the conversation should shift to confirming these goals with the rest of the business. It does no good to have an IT-DR plan and not test it, since many untested plans are outdated, and therefore, ineffective at the time of an actual event. A lot can be learned from Jurassic Park in the way of what not to do. Hindsight can be 20/20, and it’s easy to point fingers at characters in a movie. The problem is that many of the issues in Jurassic Park all too common in modern-day business, so it’s best to consider whether you see inklings in your own company. If DRaaS sounds like something that might facilitate a good DR plan at your business, then check out this beginner’s resource.